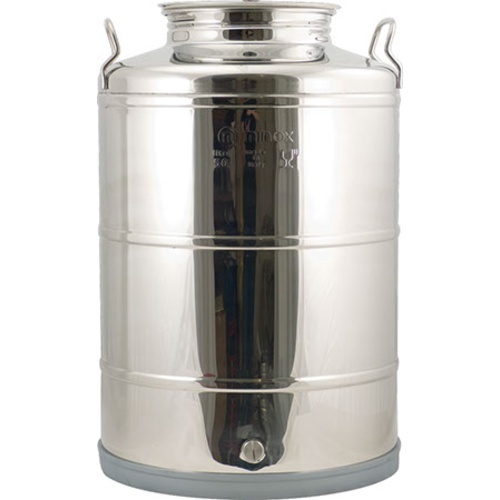 The tank is a very pretty, polished stainless steel. The lid come with a gasket and seals very well. I used a step bit to drill a hole in the top of the lid, fitting it with a am using it as a primary fermenter. I was told by the company that they wouldn't recommend this, but I've made plenty since I got this beaut. and it's working just fine. I just ordered another to use as a secondary. I'm making primarily beer with this, but I plan to use for wine making as well. I'm giving it 4 stars because the product came damaged, though packed very well, it still had a dent in it. I contacted the company, MOREWINEMAKING.COM and they informed me that this was a common problem. They ended up giving me a 15% discount, but it still was frustrating. Thankfully the dent was on the lower, back half, but had it been on the front I would have sent it back because the aesthetics would have been lost. I'm looking forward to the next one arriving and will post another review of that one when it shows up.